Everybody talks about it, but not many people actually know what it means. This supplement features experts to give you an E-Rate 2.0 cheat sheet. Check out best practices from best practitioners across the U.S. Also, Lisa Gonzales and Charles Young share their top 10 picks for PD approaches that should go the way of the Dodo Bird. The Fall 2014 School CIO Summit in Redwood City, CA , brought together K-12 thought leaders from around the country to focus on rethinking school from the ground up. The Culture of Assessment: Good or Bad? In the introduction to his new book, Who’s Afraid of the Big Bad Dragon?, Dr. Yong Zhao takes apart the current culture of assessment. A counterpoint excerpt comes from the book, Leaders of Their Own Learning: Transforming Schools Through Student-Engaged Assessment. Engaging girls in STE M is about solving problems, helping others, and being creative thinkers. 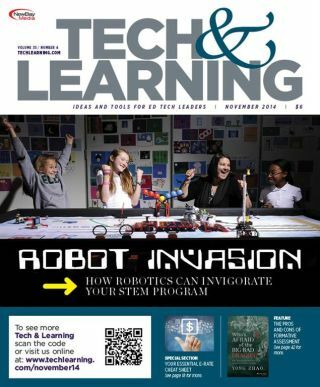 At The Ellis School, an all-girl, independent school in Pittsburgh, PA , every girl has the opportunity to learn to code, build robots, and learn about engineering. • T&L Reader Survey: Did you participate in October’s Connected Educator Month?